Several months ago, before I began an official "Tot School" with my now-33 month old son, I began learning about Maria Montessori. She taught that our children learn based on their individual needs and interests. All we, as parents and educators, must do is give our children the tools and their minds will help them learn. 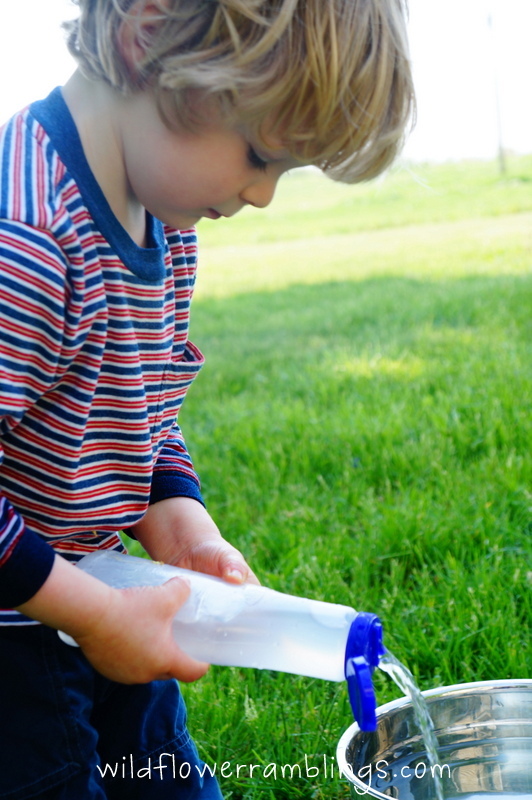 My first dive into practical life activities began when I let my son have a teapot full of water in our kitchen. He was so excited to work on the preliminary exercises of pouring and stirring and transferring. I didn't realize that these are valuable life skills that all children deserve to learn -- and children love water which is sensory learning as well. 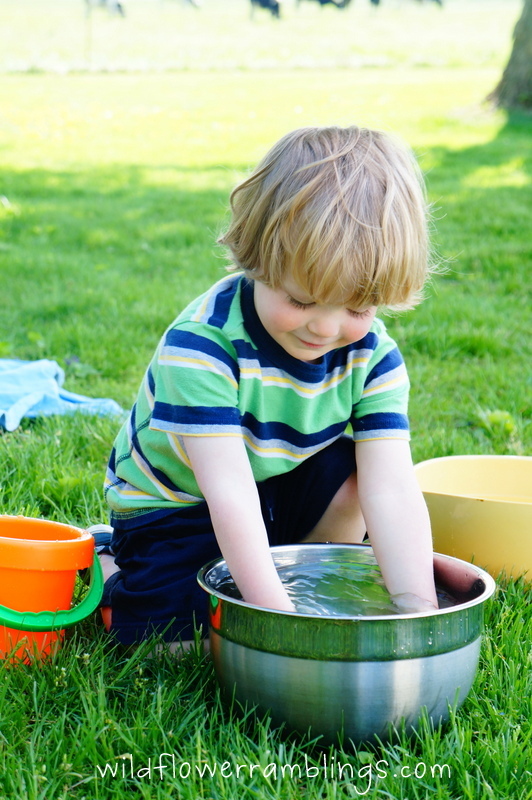 Water play is even more fun outside of the bathtub! And water play is easy to assemble. All your child needs are some supplies from the kitchen. Bowls, cups, pitchers, spoons, strainers, any other containers that have been cleaned and rinsed. I love to do sensorial play -- with shaving cream, fluffy stuff, and other fun (and messy!) 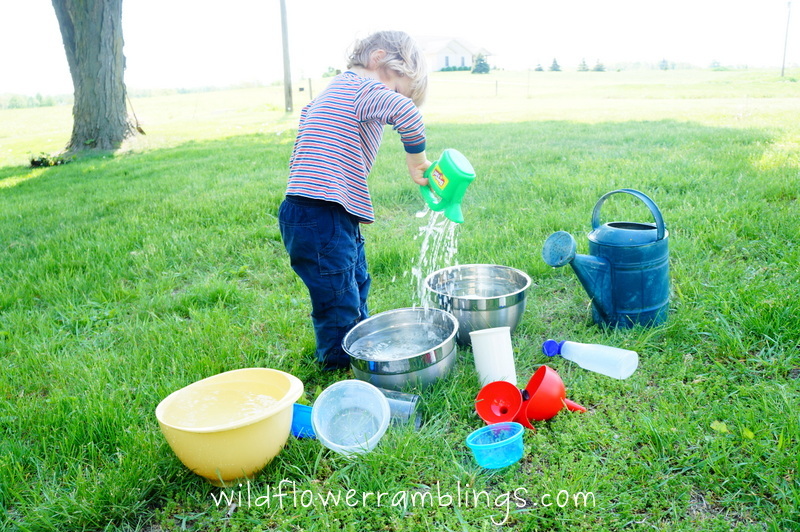 options -- but this sensory play time is as easy as changing their wet clothes -- and it is free! We took our learning outside last week, and he had a blast. Filling an old jam-squeeze plastic container and learning about water displacement. Transferring water from one bowl to the other. Stirring his water and more displacement science learning. What could be more fun than dumping water everywhere? 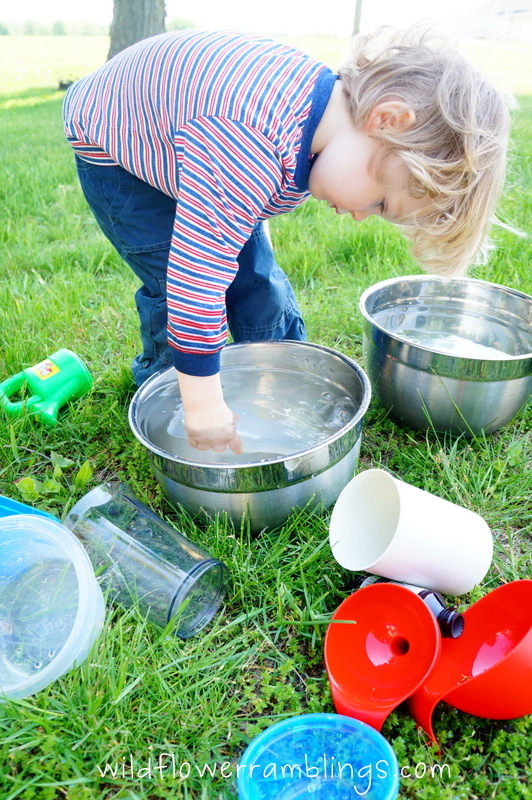 For more structured water play ideas, check out Teaching Mama's latest post on Water Activities. 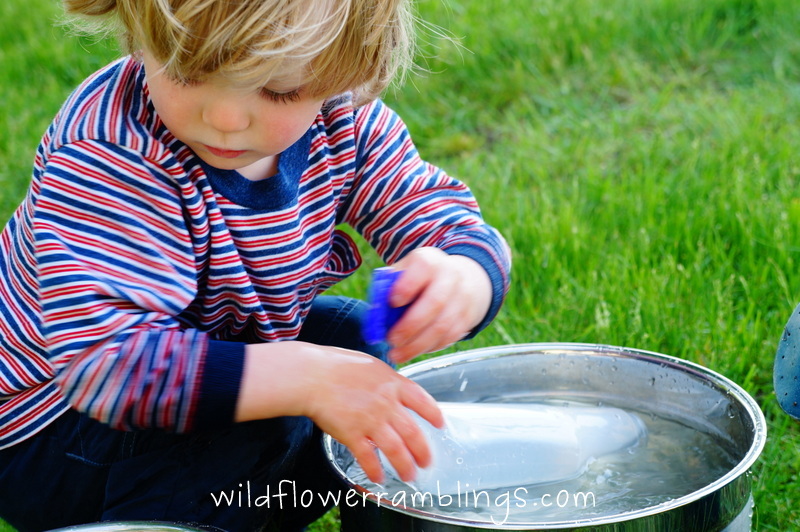 Have you tried simple water play? How have you taught your child practical life skills? 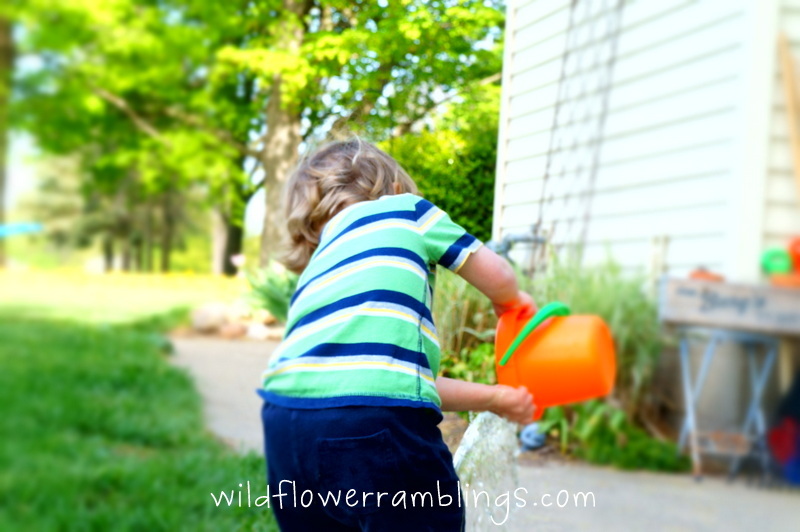 Amy writes at Wildflower Ramblings, a homeschooling and healthy living blog she started when she became a mother. Amy obtained her Masters in Elementary Education from the University of Michigan and is a former Kindergarten teacher. She lives with her husband and almost-three year old son and eight month old daughter, and all three are the loves of her life. You can find Amy on Facebook, Twitter, Bloglovin', or Pinterest. 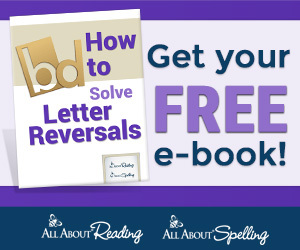 A big thank you to Amy for sharing her simple learning activity! 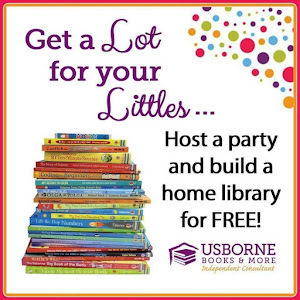 Make sure you check out her blog for more simple preschool learning!